If you follow technology in education, it is clear that the Chromebook has become a primary device in our schools. Many schools are going 1:1 with Chromebooks, sometimes after a multi-device pilot, and sometimes after choosing not to update existing iPads to a newer version of the iPad. 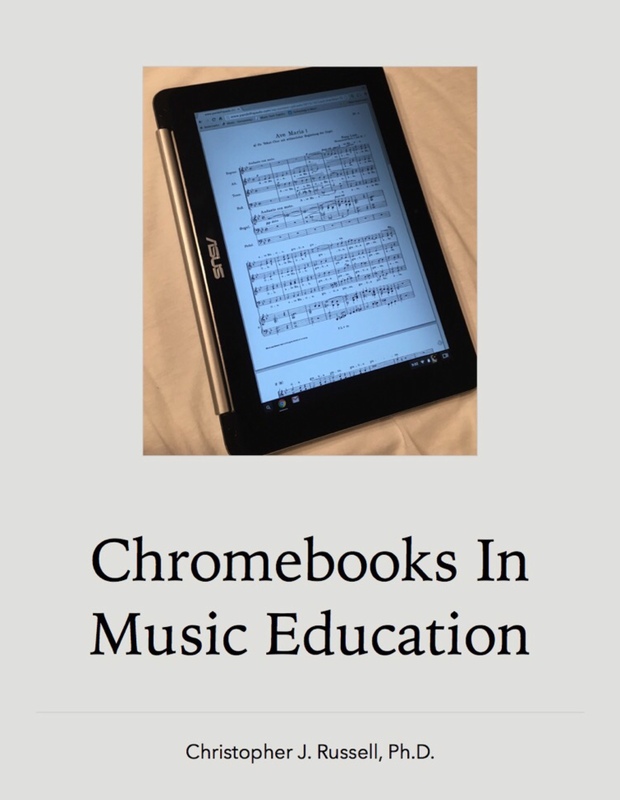 After purchasing a new Chromebook this fall, I decided to write a book about how to integrate iPads in music education. I don't sugar coat the truth–there are better devices for music education, and it can be tricky to integrate Chromebooks into music education. The book includes a list of web apps that can be used in music education, as well as some broad technology integration strategies that can be used in music education. I also included discussions about the exciting developments in the Chromebook, as well as the recent news that might signal the end of the Chromebook as we know it (by Google) as soon as 2017. At the moment, the book is short and a quick read (79 pages on Kindle). I plan on adding to the book in the future, as I have with my other books. If you buy the book, and you have additional web apps that you would like to see included–or strategies, please send me an e-mail. Additionally, if you see any glaring mistakes, please let me know, too. Since the Chromebook is not an Apple device, I have published the book on both Amazon (Kindle edition that can be read on any device) and the iBooks Store. The links below are referral links. When you sell a digital book on Amazon or the iBooks Store, you earn 70% as an author. The referral links do not add to the cost of the item, but direct a further percentage of the sale from the company to the individual who refers the book. 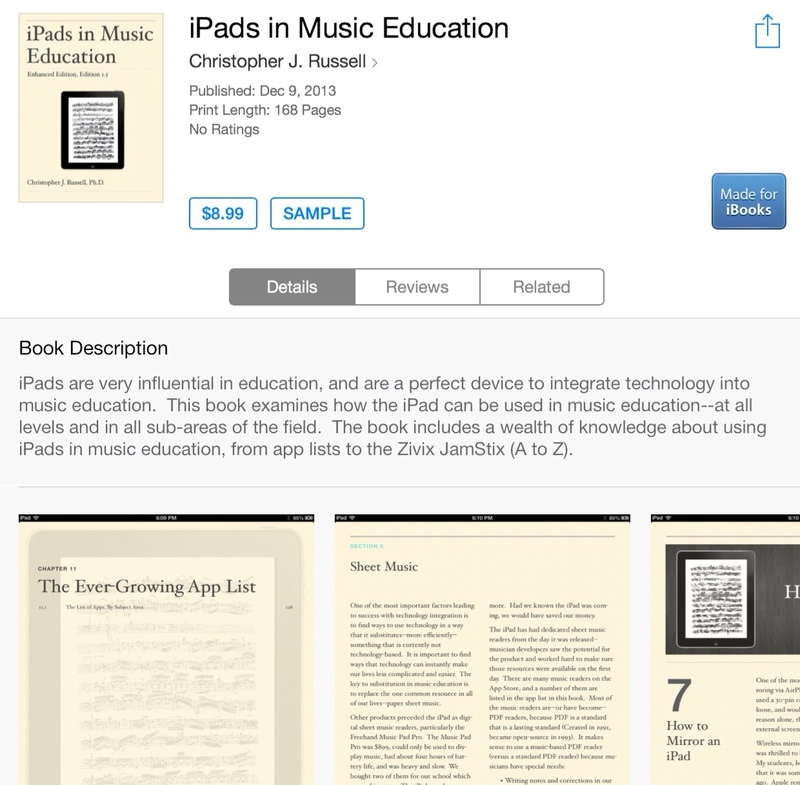 I had updated my eBook, iPads in Music Education, in early December, and it was stuck in the Apple approval cue during that time, I am happy to announce that the updated version is now available in the App Store. The book includes new chapters, updated app lists, and other general improvements. If you already own the book, it should be a free update; if you haven't purchased the book, you can do so today (link). There have been new apps introduced since I submitted this update: I will continue to update this book as time goes on. Thank you for your support! I have one other title in the iBookstore (Practical Technology for Music Education – $4.99) and that approval process was also about a month in length, but the document had been reviewed and received a “ticket” from Apple that needed to be resolved about two weeks in to the process. I understand that the iBookstore may be exploding due to iBooks Author (I’m not sure Amazon has realized how much iBooks Author is going to change the landscape), but in that case, expand your staff! And there is no guarantee that when the book is reviewed that it will be accepted without revisions (or accepted at all). So…if you are publishing to the iBookstore as an individual…prepare to wait! This will be the last blog entry (at least, for a while) regarding my iBook that is available on the iBookstore. There are a few things I wanted to mention about the iBook that I forgot to mention in my last post about the book. The price of the iBook is $4.99. It is public knowledge that to sell a book on the iBookstore, Apple gets 30% of the price, and the author (or publisher) gets 70% of the price. When all is said and done, each iBook brings in about $3.49 (US)–at least before income tax. The book is priced so that it is a good deal for the reader, and so that it has the potential to bring in a small financial reward for putting together the book–not to mention as a incentive for me to create a second edition of the book in the future, as technology will continue to change. At this point, I do not plan to create a PDF version of the book to sell via PayLoadz, and I will probably remove my previous editions from the PayLoadz store in the near future. My iBook is listed in the category of education, which is a category in the iBookstore, but it is a category that does not appear on its own in the iBookstore. So other than word of mouth or by using search by title, I don’t know how people will find the book. If you find an error in the book, please take a moment to send me a correction. Apple won’t allow me to update content with the same ISBN, but I can correct spelling errors or similar issues. In re-reading chapters, I’ve already found some errors, which I’ll wait to update when I have a good number to fix at one time. I may be able to add a new app link here and there, but I am not sure at what point Apple will allow this to continue without considering it additional content. Supposedly, iBooks update the same way as apps update in the AppStore (free to purchasers). And finally, if you find my iBook worthwhile, please recommend it to others. Thanks again for your support! I hope you enjoy Practical Technology for Music Education! It’s here! My iBook now available in the iBookstore! 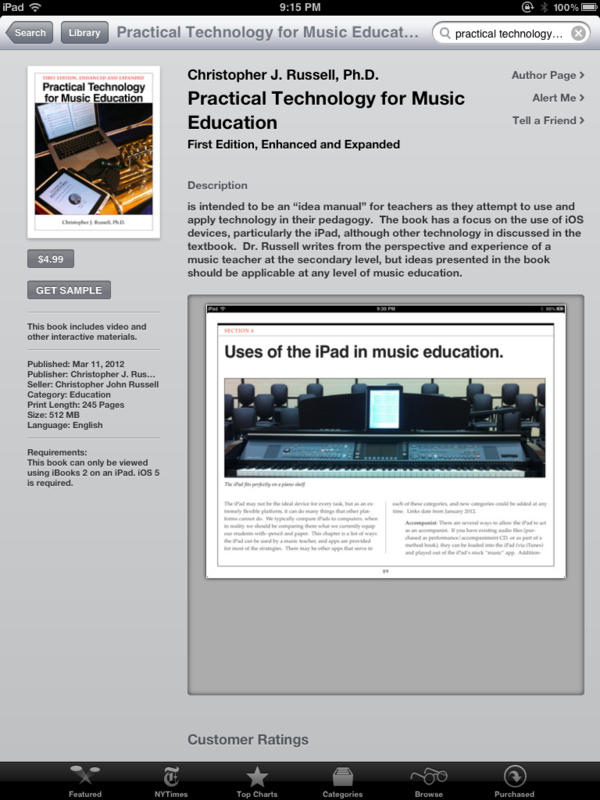 I am very happy to report that my iBook, Practical Technology for Music Education, is now available in the iBookstore. The cost is $4.99 US, and the book should also be available in other English speaking countries as well (UK, Ireland, Australia, and Canada). If you are in another territory, please be aware that all the links to the iTunes Store in the book are linked to the US iTunes store. I’ve sent an e-mail to everyone that bought the previous (non-iBook) version of my book to offer them a promo code for the new book. A big thank you to everyone who purchased a copy of my book in the past, and a thank you to everyone who purchases it in the future. I uploaded a new edition of the iBook to Apple tonight, which includes a short chapter on the new iPad, and a few other minor additions. The news is that my previous ticket…about a month old (okay, three weeks) was removed. Hopefully this will lead to faster acceptance. Some form of my iBook had been waiting for approval since late January. 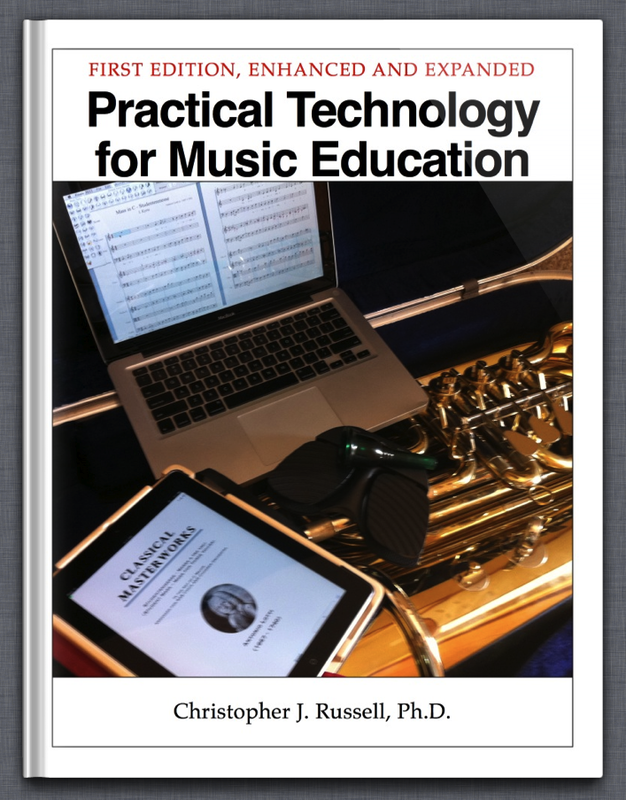 Since Apple’s education press conference on January 19th, I’ve been spending the majority of my late evenings converting my eBook, Practical Technology for Music Education, to the new iBooks textbook format through Apple’s iBooks Author. The new book has one review widget, many pictures, three videos, many more links, and a chapter on music education apps that meet Bloom’s Taxonomy, the National Standards for Music Education, and the Minnesota Arts Standards in Music Education. The book weighs in at 532MB with the additional materials. There are quite a few resources for images that are in the Public Domain, or that are under the Creative Commons or GNU licenses. These latter services allow you to use images as long as you cite the author of the image and the location of the original material. In some cases, I was able to contact the creator of a picture that was not under the Creative Commons or GNU license, and was able to receive permission to use an image. There is an intro to the book that utilizes a short video (slide show, really) of music technology over the ages…finding music in the Public Domain to use underneath the video was harder to accomplish than I would have thought it would be. You will want to copyright your book. This can be done online, and requires you to generate a PDF of your book so you can attach it digitally to the Copyright Office. $35. An ISBN number. My book has a ISBN number at this point, and I will write more about that after my iBook is on the iBookstore. You will need to make a Sample of your book that users can download and peruse, to decide if they want to buy the book. Basically, you will want to duplicate your book, delete resources you don’t want to include for free, and then export as an iBook (not through the Publish feature on iBooks Author). You will also have to download iTunes Producer, which is the program that interacts between iBooks Author and iTunes/iBookstore. You will need to take some screen shots of your book that you will upload. This can be done on the iPad. However, be aware that the iPad will save those images as .PNG files, but iTunes Producer requires those images to be .png files (lower case). Then you follow the steps of iTunes Producer, upload your book, and wait for approval or a list of things you have to fix.